I would suggest only shampooing color-treated hair every other day at the most. Stretching shampoos will not only help your color last longer, it will help protect your hair against over styling it with heat. 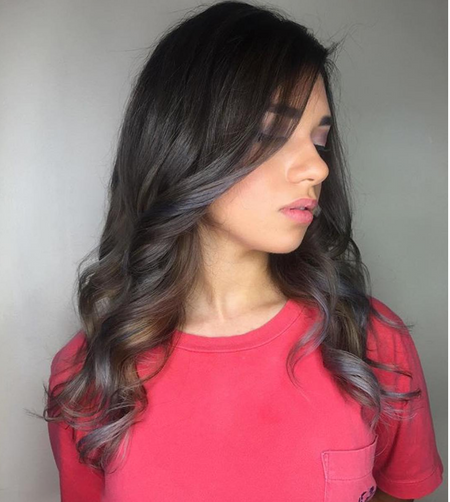 The best thing you can do to help your hair last in between shampoos is to use a dry shampoo that does not strip out color and will absorb the oils from your scalp. My favorite is the Bumble & Bumble White Hair Powder. What water temperature should you use? Yes, the temperature of the water can affect color treated hair. Much like the temperatures you use on your washing machine, the same applies to your hair color. Hot water opens up the cuticle to your hair and if you are using water that is extremely hot it will penetrate it too deeply and strip out some of the color. Using warm water to shampoo is a much safer bet. Also rinsing your conditioner out with cool water should be your final step. That way you can seal the cuticle down and your hair color in. Are there certain shampoos/conditioners and ingredients to avoid? Using products that are for color treated hair are very important. Check to make sure that what you are using is sulfate free. Sulfates are the chemicals in products that strip away dirt, oil, and impurities from your hair, but unfortunately they can also wash away the color molecules. My favorite sulfate free shampoo and conditioner is PureOlogy Hydrate. There is speculation that using a deep conditioner will penetrate your hair shaft too deeply and therefore push out the color molecules. This has not been proven and I’ve only seen color last longer when a client is on a deep conditioning regimen. Keeping hair hydrated will help your cuticle stay healthy which in return will seal in the color molecules. Ultraviolet rays have been shown to zap the protein out of your hair. And hair without protein is like swiss cheese, which means it is extremely porous. It will grab hair color molecules like crazy at first and then shed them pretty quickly. So yes, a sunscreen for your hair is very important. My favorite is Bumble and Bumble Invisible Oil Heat/UV Protective Primer. Are there any activities to avoid? Chlorine is a chemical that bonds to hair and skin and can have disastrous results on color treated hair. It can cause hair color to fade by pushing out the color molecule and in some cases the hair can take on a greenish cast. The best way to avoid having your hair absorb the chlorine is by wetting it first before you enter the pool, and rinsing it right after you get out. Also using a clarifying shampoo after swimming is a great idea because it will help to remove chlorine and not give it a chance to settle into the hair shaft. My favorite is PureOlogy Purify. Lots of clarifying shampoos ARE NOT color safe, so make sure you check the bottle first. Heat damages hair much the same way as UV light does, by stripping out the protein. That’s why shampooing less will assure you heat style it less and help retain color molecules. If you must heat style your hair frequently I would suggest a heat protectant. One of my favorites is Milk by Reverie. Another trick I suggest to avoid over heat styling is to shampoo your hair at night and let it dry overnight while you sleep. Once you get up, you can style with your curling or flat-iron. That will at least help you avoid blow drying it as well. Although some hair types might be too frizzy for this method, if you try it once, your hair will let you know! Should you use a shower filter? Yes, using a shower filter will help preserve hair color by removing chlorine and minerals that strip protein and hair color from your hair. The one I use is The Enviro Premium Shower Filter. It’s so easy you can install it yourself. Prepping your hair before your next hair color appointment can definitely help insure that your color takes beautifully and lasts longer. What that means is clarifying your hair before you go in, and coming in with hair that is less than two days dirty. Too much oil on the scalp can dilute the hair color and it won’t penetrate the hair shaft as well. Also sticking to regularly scheduled appointments to maintain your color is very important. If you let it go for too long it’s much harder to match the same color and to achieve consistent results.